A card game of mythic proportions. Catch Zeus if you can! The great Greek god has bolted and it's up to you to nab this dashing deity. Play cards strategically, adding numbers as you climb Mt. Olympus. Grab Zeus when the total reaches a multiple of 100. 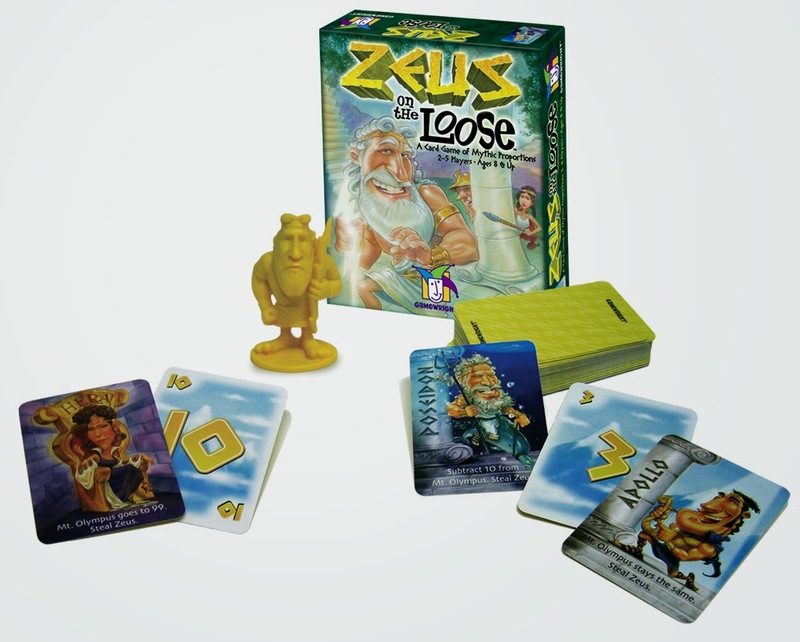 To win you must be the 1st player to accumulate the letters Z-E-U-S by holding on to the Zeus figurine. 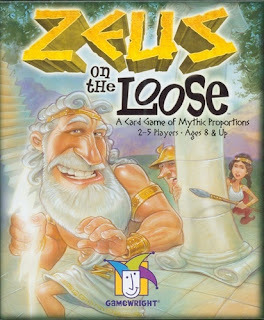 The game consists of 40 cards numbered from 1 to 10, 20 cards of 8 Greek Gods, and a Zeus figurine. The game is played in rounds. On each turn, a player will play a card from their hand to a central discard pile termed "Mount Olympus" and then draw a card from the top of the draw deck. The objective is to get the numeric value of the Mount Olympus pile to 100. Numbered card advance the sum total of Mount Olympus. The Greek God cards have special powers, naturally because they are Gods after all. These special powers when played, can affect the sum total of Mount Olympus or worse steal Zeus from a player. Aphrodite likes to round Mount Olympus' total to a multiple of 10. Meanwhile, Poseidon will subtract 10 points from the total. But watch out, Apollo, Artemis, and Ares will steal Zeus from you. Play continues until the total of Mount Olympus reaches 100 or greater, or the draw pile is exhausted. 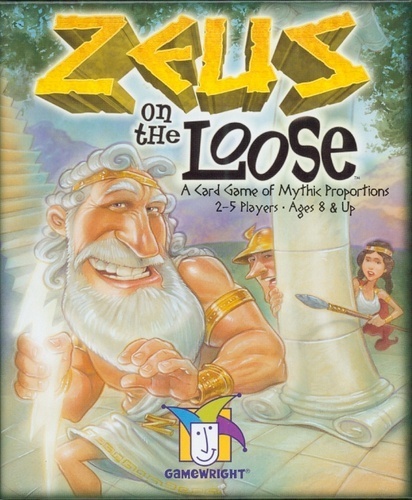 The winner of the round receives the Zeus figurine and the letter Z for their 1st win. Shuffle all the cards and begin a new round. Rounds continue until a player has won 4 rounds giving them the letters Z-E-U-S.
To play is human. To win is, divine.